Repeated Political Agent A mid-ranking political representative (equivalent to a Consul) from the diplomatic corps of the Government of India or one of its subordinate provincial governments, in charge of a Political Agency. , Bahrain. 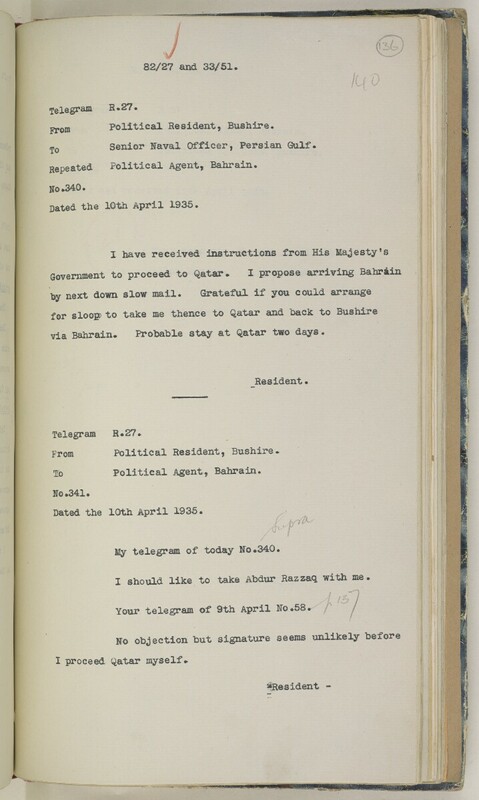 Dated the 10th April 1936.
via Bahrain. Probable stay at Qatar two days. lo Political Agent A mid-ranking political representative (equivalent to a Consul) from the diplomatic corps of the Government of India or one of its subordinate provincial governments, in charge of a Political Agency. , Bahrain. Dated the 10th April 1935. My telegram of today No#340. I should like to take Abdur Razzaq with me.